In 1937, the Spanish Civil War was raging. On one side, the insurgent army of fascist General Francisco Franco received ample support from Nazi Germany and Mussolini’s Italy, in the form of both expeditionary forces and massive arms supplies. On the other side was the democratically-elected Republican government in Madrid, and allied militias organized by an assortment of socialist, communist, and anarchist parties – all of which Franco wanted to utterly demolish. Western powers, including the US, Britain, and France, nominally had a policy of “non-intervention”, which meant that the Republicans received material aid from only from the Soviet Union and Mexico. Volunteers from around the world – through, for example, the International Brigades – arrived in Spain to fight for the Republican cause. The conflict was, legitimately, understood by many as the front-line in the battle against encroaching fascism and as the opening guns of a second world war in Europe. In January of that year, representatives of the Spanish government visited the prominent Pablo Picasso, then living in Paris, and asked him to create a mural in support of the Republicans and for exhibition at the upcoming World’s Fair. Picasso was sympathetic to their struggle in his native. However, he was initially uncertain as to how the war should be represented in the planned large-scale work. In an attempt to terrorize and demoralize the Republican population, the German Condor Legion, at Franco’s behest, carpet bombed the Basque town of Guernica in April, destroying large areas and reportedly killing or injuring thousands. This indiscriminate slaughter of civilians was one of the first instances in Europe of such air attacks (though not elsewhere). News reporters covering the conflict in Spain arrived on the scene the same day, and their dispatches spurred international outrage. Picasso now had the impetus for the final mural. Guernica was seen in the Spanish Pavilion later that year in Paris by hundreds of thousands of World’s Fair attendees; in early 1939, it traveled to London’s Whitechapel Art Gallery, where it was seen by tens of thousands more. The British tour was supported by the Artists’ International Association (AIA), local trades councils, and other organizations raising political awareness of the Republican cause and providing aid (ambulances, field kitchens, and refugee relief, for example). The London opening featured a talk, not from any conventional artworld figure, but from the leader of the left-wing Labour Party. The price of admission was a pair of boots, which were to be sent to fighters in Spain; rows of boots were left at the base of the mural by workers – many from the nearby, working-class East End – visiting the exhibition. In his recent 9.5 Theses on Art and Class – a collection of essays written over the past seven or eight years, with some new, some old, and some reworked for the publication of the book – Ben Davis remarks that little depicted in the renowned Guernica is specific to the bombing itself. Particularities of the doctrine of total warfare, the political context, the global struggle against fascism, and even modern life in general (excepting the lightbulb at the top-center of the canvas) are mostly absent from the work. Instead, Picasso used archaisms, such as the oil lamp and the shattered blade of a sword, and many of his traditional motifs, such as the bull, the horse, and the corrida. From the paradigmatic instance of engaged, militant art, Davis reasonably concludes that “in the relationship of art and politics, the political movement of which an artwork is part determines its overriding power, trajectory, and meaning”. Davis is a Marxist, as well as until recently the executive editor of Blouin Artinfo, and became a political activist in New York City when he also began writing professionally about art, in the middle of the last decade. He describes, at a time when major anti-war protest was still a presence, inviting an artist he had met recently to an upcoming organizing meeting; the artist declined, saying that his painting was a sufficient “contribution to making the world a more peaceful place”. 9.5 Theses is deeply critical of the tendencies in contemporary art, and their theoretical edifices, that claim in different ways to substitute on-the-ground political mobilization with art and its practices. In a discussion of the 2007 book Collectivism after Modernism: The Art of Social Imagination after 1945 , edited and introduced by Blake Stimson and Gregory Sholette, Davis argues against, for instance, collective artistic labor becoming the “template” for committed art or assuming the “dignity of a full-blown alternative politics”. He caustically points out that musicians have routinely formed bands, without that collective labor being philosophically elevated into a putative political model, and that, indeed, most creative labor outside of the insular “artworld” is already performed, in a capitalist society, by anonymous workers in teams. Jennifer Allora and Guillermo Calzadilla were selected to be the official US representatives for the 2011 Venice Biennale in Italy. Their contribution to the US Pavilion included the installation Track and Field, an overturned fifty-ton tank with a exercise treadmill atop one of its tracks and a real Olympic athlete jogging on the treadmill. The artists viewed their piece as “critical” of US militarism. However, the US government itself, which had approved their proposal, found that piece far more conducive to its agenda, at a time when US armed forces were still occupying Afghanistan and intervening elsewhere. One State Department official referred to the use of “smart power” and a “softer image” internationally, which Allora and Calzadilla’s installation helped enable. Allora & Calzadilla, Track and Field, 2011. U.S. Pavilion, 54th International Art Exhibition, presented by the Indianapolis Museum of Art. Another chapter suggests that these two wildly disparate interpretations of Track and Field demonstrate the limitations of an “aesthetic politics” disconnected from the particularities of the actually-existing situation. By way of the theories of hegemony as put forth by Antonio Gramsci, a leader in the early Communist Party of Italy, Davis argues that “modern capitalist states rule via combining direct force with efforts to gain ideological legitimacy” and that the artwork ended up well serving the latter purpose. For in 2011, the particularities of the situation included the Obama administration’s “new” approach and rejuvenated efforts to globally shore up the ideological legitimacy of the US; this was understood by many as very different from the overtly-belligerent approach of the immediately-preceding Bush administration. Also, by that point, the antiwar movement had long since ceased to bring enormous number of people into the streets; a concrete foundation for the artists’ “critical” aims was thus lacking.. These concerns drive Davis’ perspective that art’s political meanings are determined by the real, specific political situations – not just by the abstract properties of a form, medium, or practice – and, as well, that artists should engage with real, on-the-ground political movements. While certain projects are suggested, such as agitating for increased funding for arts education in conjunction with the defense of beleaguered public school systems, 9.5 Theses mostly leaves open the question of how exactly those should happen going forward. The book is primarily about contemporary art and not historical instances of art’s engagement with such movements. The concluding chapter has only a brief on three of those instances: the Great Depression era in the US, when early modernists, such as Stuart Davis, and social realists made committed art and actively supported the labor struggles raging around them; Womanhouse, a highly-influential installation organized in Los Angeles in the early 1970s by Judy Chicago and Miriam Schapiro and which was a popular conduit, with ten thousand attending over the span of a month, for the then-new practice of feminist consciousness-raising; and Gran Fury, a key arts-and-graphics collective in ACT UP, the AIDS Coalition to Unleash Power, which was battled criminal government neglect of the AIDS crisis in the late 1980s and early 1990s. This need for greater involvement with broader movements outside of the “artworld’s” confines is a perspective further buttressed by Davis’ definition of artists as middle-class and not working-class. A Marxist definition of class is not based upon income (as to do so would have strange effects). For instance, a middle-class person who is not a member of a union can easily make less in wages than a working-class person who is in a union; a member of the petit-bourgeoisie, i.e. a small business owner, can have employees but still be poor. Davis is not claiming that artists are making a good living from their art; ample evidence he cites indicates their real, onerous conditions. 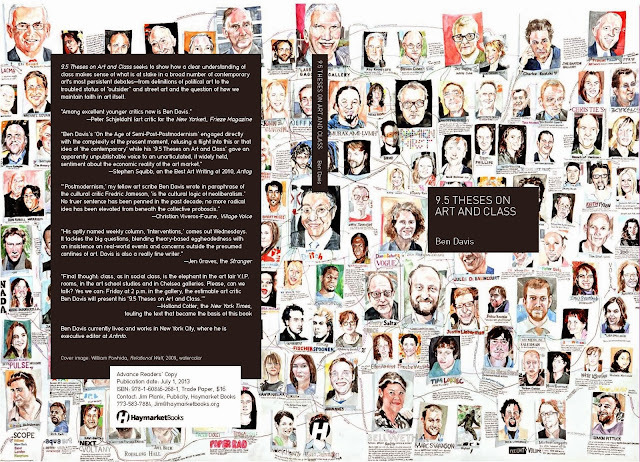 One widely-circulated estimate in the early 2000s (from Dan Thomson’s The $12 Million Stuffed Shark: The Curious Economics of Contemporary Art) was that, out of 80,000 or so visual artists in New York City and London combined, there are 75 superstars with incomes above one million and 300 “merely” successful artists with incomes above 100,000. Making a living from their art is only a “dream” (the term in Davis’ little pamphlet from which the book gets its title) for the significant majority of everybody else, who require other jobs or supplemental income; these other jobs will make them (in most cases) working class. What, then, drives Davis’ particular definition of artists’ class position? First, there is the question of the labor process. Middle-class labor is performed with greater creativity and autonomy; working-class labor with lesser. Davis notes of the first type: “artists function as their own … franchises, and are expected to have their own … signatures or styles”. Moreover, “uniqueness and independence of mind are selling points when it come to art”. Of the second type, with which most of us are quite familiar, he notes that the working-class “must take direction”, via regimentation, “corporate mandates”, and other mechanisms. Workers are also “ever more disposable”; they must “sell their labor power as an abstract thing in order to earn a wage”. Second, there is the question of the final product of the labor process. The working-class, obviously, is strictly exchanging its labor power for a wage and has no control or claim over the final product of that work, which is sold by a boss for profit. However, artists, paradigmatic of the middle-class, have a much greater degree of control over the final product of their work. Davis points to the examples of longstanding “struggles over intellectual property” law, as well as “contemporary debates over whether artists deserve ‘resale royalties’ for works sold on the secondary market”. Of this distinction between middle-class and working-class creative labor, Davis draws a useful analogy: “The difference between a visual artist and a commercial artist is not unlike the difference between someone who owns their own food stand and a cook who works at a restaurant. Both make food. One has more say over what, how and when it is made and to whom it is sold”. 9.5 Theses posits a working-class artistic ideal, which “represent[s] a form of labor that is opposed to the demands of work, as freely determined expression, whether private or political. Viewed from this angle, art is deprofessionalized and in this sense is actually more ‘free’ than the middle-class ideal of personal-expression-as-career”. The significant majority of artists have minimal, or zero, material encounters with the markets or other institutions. In many cases, there are no transactions; nothing is sold; and work is never exhibited in a museum, gallery, or alternative space. Artists are already – whatever their “dream” may be – effectively making art solely as a free creative act and for their personal satisfaction. This real position, even though Davis has classified artists qua artists as middle-class, is already very close to the working-class artistic ideal he articulates. There isn’t a great leap from the former to the latter, and this leaves Davis’ class analysis feeling rather strained. That said, the call for artists to relate more closely to actually-existing political mobilizations, and the critiques of those who propose to substitute such mobilizations with art and its practices, are a strength of the book. As Davis states: “There are no formal or aesthetic solutions to the political and economic dilemmas that art faces – only political and economic solutions”.